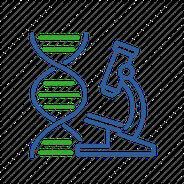 Molecular biology is the scientific discipline that seeks to fully understand the molecular basis of heredity, genetic variation, and the expression patterns of individual units of heredity called genes. Molecular biologists study how biological characteristics are passed on from one generation to the next and investigate how bacteria or viruses function at the molecular level. Molecular biologists identify living things called micro-organisms that are too small to be seen without a microscope to better understand their relation to human, plant, and animal health. They look at these organisms in relation to genetics in order to understand the inheritance and molecular basis of genetic disease. They also investigate how these micro-organisms function in the production of vitamins, antibiotics, amino acids, alcohols, and sugars. The results of their research has produced breakthroughs in medical, agricultural, industrial, and other scientific fields. Many molecular biologists believe that a chain of molecules connects each of us with the first living organisms that arose on the Earth billions of years ago. Therefore, people are all connected biologically in some form or another. Yet interestingly, all humans have individual characteristics that distinguish them from one another. 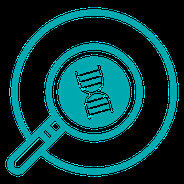 Molecular biologists conduct research into the biochemical and physiological aspects of heredity, particularly the role of deoxyribonucleic acid (DNA), and carry out molecular tests to aid in diagnosing disease. Molecular biologists help scientists and physicians in the understanding, diagnosis, prevention and treatment of infections in animals and humans by investigating how organisms cause disease and their role in disease processes. Work in molecular biology is often interdisciplinary, so they may work closely with chemists, biochemists, geneticists, genetic engineers, pathologists and other physicians, environmentalists, civil engineers, veterinarians and geologists. Molecular biologists use a variety of specialized sophisticated equipment such as gas chromatographs and high pressure liquid chromatographs, electrophoresis units, thermocyclers, fluorescence activated cell sorters and phosphoimagers. 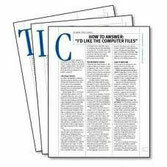 They may also use computers in conducting experiments. It is common to find a molecular biologist peering through the lens of a microscope or performing other related experiments in a laboratory. However, the nature of the work may vary considerably with each assignment. DNA (deoxyribonucleic acid) is the information storage molecule for the cell. Each cell contains within the DNA the entire instruction set to produce and run an entire organism (including you). In multicellular organisms, most of the DNA is stored in a central location within the cell, called the nucleus. When a base, such as adenine,is linked to a deoxyribose sugar through a glycosidic bond, the structure is called a nucleoside. When the deoxyribose sugar isphosphorylated, on either the 3' or the 5' position (or both), the structure is a called a nucleotide. The precursors of DNA synthesis are deoxynucleoside-5'-triphosphates or dNTPs. DNA is composed of a polynucleotide (multiple nucleotides) chain that is formed by linking nucleotides through 3',5'- phosphodiester bonds. In this way, DNAforms a long chain of sequential nucleotides. DNA chains are not usually just single strands of nucleotides. Usually, nucleotides of two polynucleotide strands are base-paired to each other. The nucleotide base adenine pairs through hydrogen bonds with the nucleotide thymine forming an adenine-thymine (A-T) base pair. Guaninebinds with cytosine forming a guanine-cytosine (G-C) base pair. Because of this base pairing, polynucleotide chains in double-stranded DNA are always complementary to each other. The nature of the bonds between nucleotide bases results in the famous "double helix" DNA structure. The hydrogen bonding between strands of DNA holds the strands together until they are separated for DNA replication or RNA transcription. DNA is replicated (reproduced) through an extremely complicated process. This is the simplified version. The two strands of DNAare separated and a new complementary strand is synthesized for each old strand by adding complementary base pairs to the newly-synthesized strand (see figure at right). The DNA polymerase (the enzyme that makes new DNA) reads the base on the original strand and adds the complementary base to the newly synthesized strand. DNA is always synthesized in a 5' to 3' direction. Since one strand runs in the opposite direction, it must be synthesized in pieces that are later connected with DNA ligase. In reality, both strands are synthesized in pieces, since the DNA is unwound at numerous sites simultaneously on each chromosome in order to produce a complete copy in a short period of time (hours instead of weeks). How does DNA turn in you ? Since DNA just stores information, there needs to be a way to turn the information into physical bodies. This feat is accomplished through the synthesis of an intermediate information-carrying molecule that carries the information from the nucleus to the cytoplasm, where it is processed into proteins. The intermediate molecule is called RNA (ribonucleic acid). As you can tell from the name, it differs from DNA in that part of it (the ribosesugar) has an extra oxygen compared to DNA (the "deoxy" version). In addition, RNA does not use thymine as a base, but another nucleotideknown as uracil (see figure right). 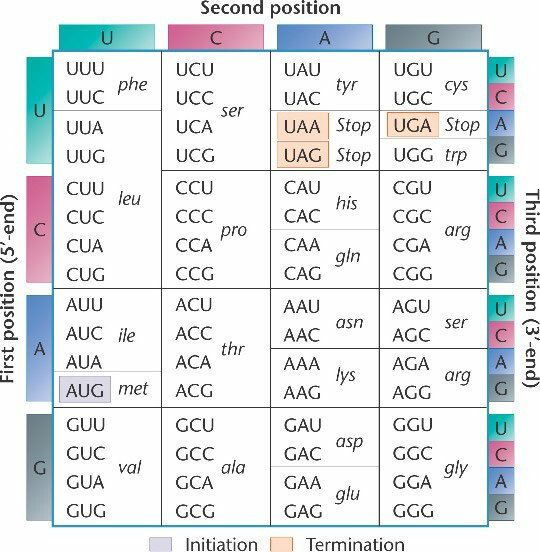 Uracil forms base pairs with adenine, as thymine does in DNA. RNA is transcribed from DNA through an enzyme called RNA polymerase, in a process that is known as transcription. There are several kinds of RNA, which have different functions. However, the RNA that eventually codes for proteinsis called messenger RNA (mRNA). The 30s subunit of the ribosome binds to the mRNA. A specific tRNA (usually the first codon codes for methionine) binds to the codon of the mRNA The 50s ribosomal subunit binds to the 30s subunit. The next tRNA binds to the next codon on the mRNA and numerous initiation factors and the enzyme peptidyl transferase link the two amino acids together through a peptide bond. As the ribosomal complex moves along the mRNA, the peptide chain gets longer until the entire protein is formed. Other molecular machines are responsible for making sure that the protein folds into the correct three dimensional shape. Ribosomes are small organelles found in the cells of all life forms. They are quite small, only a few hundred nanometers across. It has been theorized that ribosomes were once independent life forms, reproducing on their own, until other chemicals such as carbohydrates and DNA were brought into the fold at a later time. Ribosomes are composed of rRNA (ribosomal RNA, or ribonucleic acid) and other catalytic proteins. Their main function is to produce a variety of proteins from simple genetic instructions which propagate outwards from the cellular nucleolus in the form of messenger RNA (mRNA). Ribosomes float in the cytoplasm of a cell or bind to the endoplasmic reticulum, ribbon-like structures found within the cell. Ribosomes are sometimes referred to as simply RNA. Like DNA, they are long chains of amino acids, but their base pairs are different and they are usually not as long as DNA. Ribosomes play a key part in protein synthesis, the process that generates organic tissue. 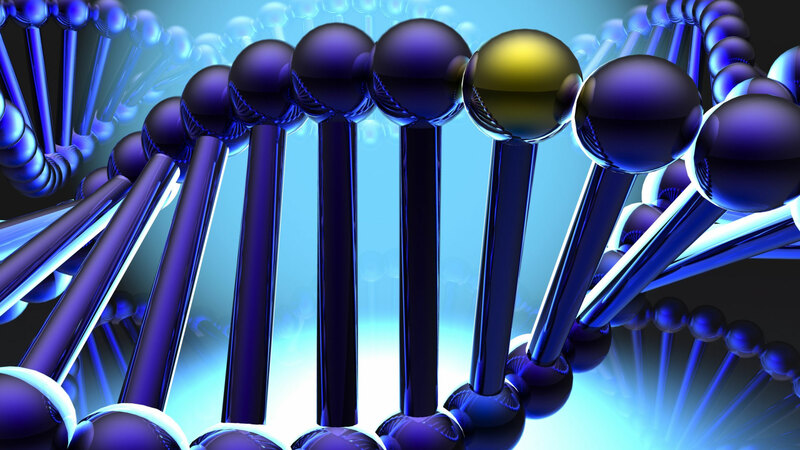 Genetic instructions for the creation of new proteins come from mRNA. Ribosomes always have two subunits which interlock and behave as a single entity. The exact type of ribosome found within a cell can vary based on the kind of organism that the cell is a part of. Eukaryotes (multi-celled organisms) have their own kind of ribosome, whereas prokaryotes (single-celled organisms) have another. Certain organelles within the cell, chloroplast and mitochondria, have their own distinct ribosomes as well. Ribosomes make up the majority of RNA content within a cell, being responsible for about 95%.